Aoyama Meguro is pleased to announce “Figured in the Drift of Things,” our third solo exhibition with artist Hirofumi Isoya, after four years since the last one, will be held from Saturday November 17 to Saturday December 22, 2018. It will feature an installation composed of works combining object and photography, along with a brand new sculptural piece, together pushing forward the artist’s recent pursuit of re-questioning both linearity of our sense of time and the consistency of our perception. The title of the exhibition, “Figured in the Drift of Things,” alludes to Isoya’s attitude where sculptures and photographs, both normally considered still, are viewed no longer as fixed objects but as events in their own right, as fluxes drifting in time. 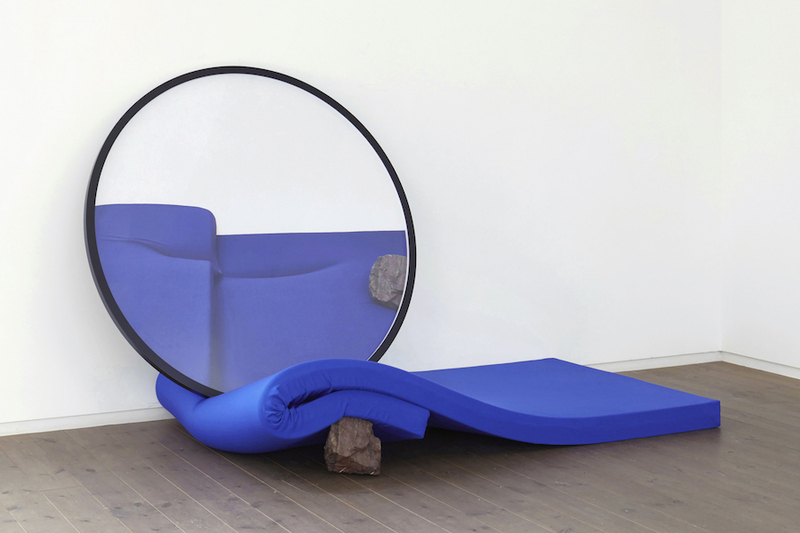 A big round frame put on a blue mattress, containing a photograph that captures a situation where the very frame is rendered absent from the present setup — as such, each piece from the series Parallax Gesture playfully betrays our sense of simultaneity associated with the mirror-like form, calling attention to the hidden flux between one event and another. Made by pairing honey and a fish collecting lamp, Flowers and Bees, Translucent Archive, on the other hand, emits from within somewhat sticky light, the speed of which feels as though slowed down, illuminating the spatiotemporal environment between the work and the viewer, while mediating the past record of the honey, so to speak, archived in its translucent material body itself. “Time deserves more variety of types and options,” says the artist. Indeed, marked by co-existence of direct physicality due to their essential honesty to the nature of each material and highly humanly humor, his mixed-medium works inform us of how time can be potentially perceived in different ways and how profound it really is to fully recognize what we call an event. “Figured in the Drift of Things” will serve as quite a unique occasion for the audience to view Isoya’s latest artistic attempts. Hirofumi Isoya (b. 1978) studied architecture at the Tokyo University of the Arts before pursuing his graduate studies in Intermedia Art at the same, after which he studied fine art on the Associate Research Program at Goldsmiths College, University of London. His work reevaluates the consistency of perception and the integrated conception of time through media such as sculpture, photography and drawing, and through their mutual interaction. Last year, he showed his works in “The Specter of Surrealism,” composed of the Centre Pompidou collection, and is scheduled to exhibit in “Roppongi Crossing 2019: Connexions,” opening at the Mori Art Museum in February 2019.